The Approach- The approach is the set up of the whole thing. Get the set up wrong and you are going to be struggling throughout the whole move. There are a few things to think about in making a good set up. Try to get an angle of attack that is going to make it easy to boof well and continue on after the boof in the direction you are trying to go. If I want to finish the boof going right I will usually set up above the boof with left to right momentum and vice versa. Speed is a commonly misused part of the boof. 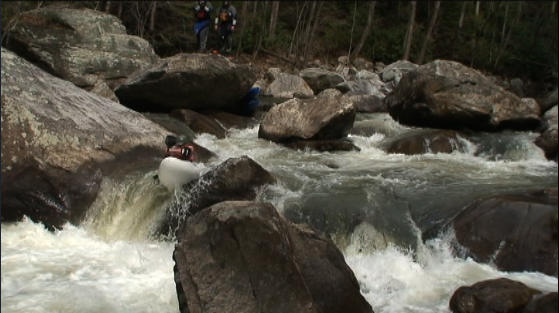 Speed does allow you to ride up higher on rocks and clear larger holes but it also make the timing more difficult. Often times I will make sure to only have enough momentum to be in control so that I will be able to precisely place and time my stroke for the boof. Mistakes people make on the approach- The common mistake people make is not getting a good angle on the boof they are trying to do. Start off to one side of the move to give you a good angle on the obstruction. One of the hardest boofs to do is a straight off boof because you have to clear the entire length of the boat to make the move smooth. Where as if you come off the drop at a slight angle the boat clears the drop more easily. 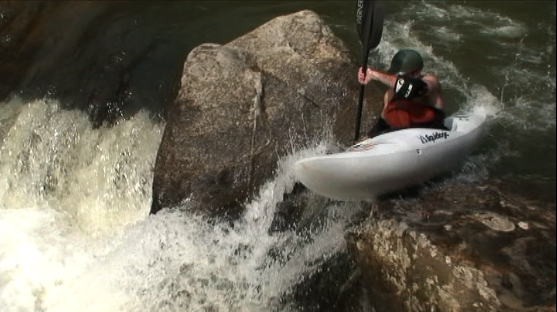 The Boof Stroke is one of the most destroyed strokes in paddling. Its right up there with the Duffek. What you want to do with your boof stroke is control the boat as its going through the entire move. You should start your stroke just before you come into contact with what ever it is that you are boofing, whether its water, rock, log, or someones head. Pull that stroke all the way through the boof so that you control exactly how you interact with the feature you are boofing, and control the direction you are going. With that constant pull you can fine tune control your angle and lift off the drop. Finally if you can continue the stroke past the feature you can throw in that last little correction to finish going in the direction you want to go. Mistakes people make with the Boof Stroke- the most common mistake with a boof stroke is running out of stroke before the end of the move. At the moment the stroke finishes the water gets to take control of where you are going. Thats when you see the classic burning man, or crucifiction boof, pull the stroke and then all the sudden the bow goes down and you are at the whim of the water. Body Control is using your body to help the move. The number one rule is to keep your body over the boat. If you are leaning you are probably having to brace so therefore you aren’t paddling and moving yourself where you need to be. In a boof your body can have a bunch of impact on how the boat performs. 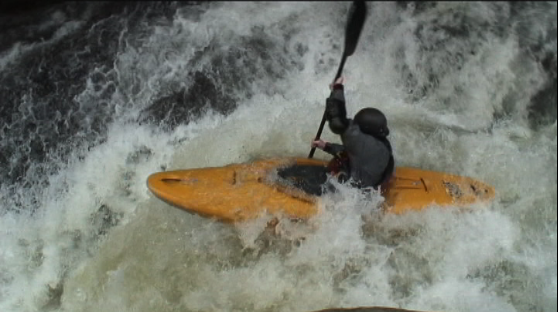 If you lean back a little as you start your boof you allow the boat to slide up a feature. Then if you lean forward you allow the tail to free up as you go off the drop and you drop your bow into a softer landing. 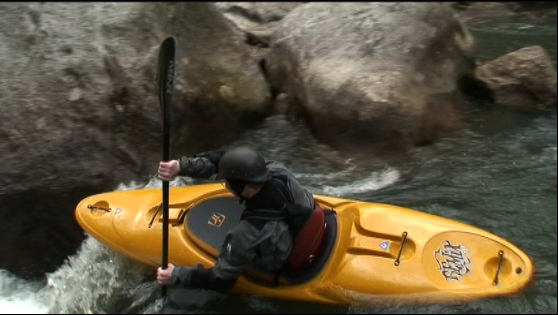 Leaning forward at the bottom also helps keep your stern from getting messed with in the drop. A common mistake that is made with body control during a boof is leaning off to a side. Sometimes it helps to tilt the boat up a little to get up on an object or lift it off the water, but as you leave that tilting boof work hard to get the boat back under you so you can land in balance. That way you can deal with what is coming next. The classic body posture mistake on a boof- is landing and having to brace or roll because your body is still leaning off the boat. Notice how Jesse is keeping his body centered over the boat. This will ensure a more stable landing. Most often boofs are used to clear pour-overs, landing on edge presents the hydraulic with a fine little place to grab and flip you. A long, powerful stroke is essential so that there is no danger of you not clearing the hole or ledge you are trying to avoid. Often, the latter part of the stroke can be tweaked with a stern draw to change your angle last minute. It is important to make sure you catch the right amount of whatever feature you are using to boof from. Too much and you can loose your momentum and spin out, too little and your bow will drop and it’s hammer time. A good vertical paddle stroke close to the boat is necessary in most straight boofs. There are exceptions to this rule, more on that in the next post. Boofing “the pad” at Gorilla, perhaps the sweetest boof around. This is a perfect example of keeping your boat level on take off. The pad is notorious for catching an edge last minute, often sending the paddler into a world of pain, be it pride or body. In our next post, we will elaborate more on the boof, introducing several different styles of boofs and where, when, and how to use them to keep you safe and happy. This entry was posted on Wednesday, July 2nd, 2008 at 5:55 pm and is filed under Beginner, Creeking. You can follow any responses to this entry through the RSS 2.0 feed. You can leave a response, or trackback from your own site.